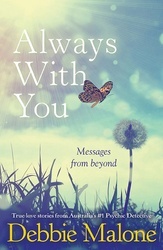 Australia's most gifted and acclaimed psychic medium, Debbie Malone, shares her most challenging and life-changing stories of healing and love in Always With You. Showcasing her extraordinary ability to facilitate communication between two worlds--the living and the dead-- as Debbie shares her powerful messages from departed loved ones on the other side to bring comfort, closure, and healing. These are the real accounts of miracles that are bound to leave you breathless with the endless love from the world beyond.